Yes, the iconic Rodgers and Hammerstein classic, based on Margaret Landon’s “Anna and the King of Siam,” has been around since 1951, but it is now entertaining a new generation of theater-goers who may have never heard of Yul Brynner, who made a career out of playing the King, winning both a Tony and an Oscar while returning to the role over and over for 35 years. The current touring production now at the Boston Opera House through April 23 is not a standard bus ‘n truck tour, but a faithful if a bit scaled-down replication of the Tony Award-winning 2015 Lincoln Center revival, with new leads but also directed by Bartlett Sher. 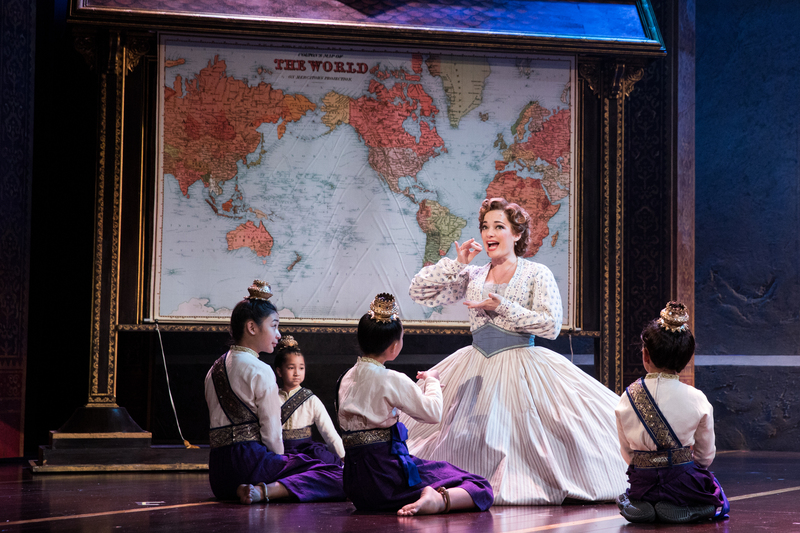 Laura Michelle Kelly, so wonderful as Sylvie Davies at the American Repertory Theatre and then on Broadway in “Finding Neverland,” is an absolute joy as Anna Leonowens, the widow who along with her young son Louis (Graham Montgomery) journeys to the exotic Siam of King Mongkut in the early 1860s to serve as a governess and teacher for the King’s many children. Thus begins a battle of wills between the no-nonsense Englishwoman and a king unused to anyone – especially a woman – challenging his decisions and authority. Kelly as Anna holds her own and then some with the King, standing her ground in her salary demands and waiting for the house she says he has promised her. Jose Llana played the King in two different engagements during the Broadway revival, and exhibits the requisite imperiousness and “puzzlement” at the Western culture. The role doesn’t have great vocal requirements, and he is able to find the humor in some of the King’s funnier struggles with English idioms and metaphors, as well as capturing the more human side of the monarch. He also captures the King’s dilemma. The King hopes to open up his kingdom to new ideas and Western learning, even as he clings to polygamy and his absolute right as a monarch to control and even destroy lives on a whim. We will eventually see him caught between his tradition-bound ways of ruling the kingdom and Anna’s decidedly feminist – especially for the time – views. Because of the awkwardness of a possible King-Anna romance, the plot delivers a secondary romance between Tuptim ( Manna Nichols), a “gift” to the King of Siam from the King of Burma, and her secret lover Kralahome (Brian Rivera), a relationship which risks the wrath of the king if they are found out. Presiding over the group of wives is the dignified Lady Thiang (Joan Almedilla), “the most favored wife” who must share the man she loves with many others, while Prince Chulakonghorn (Anthony Cvhan) waits in the wings, preparing to lead his country into its new era. The magnificent production values are authored by a swatch of Tony Award-winning types. Michael Yeargan’s sumptuous, colorful set includes a magnificent statue of Buddha. The choreography by Tony winner Christoper Gatelli (“Newsies”) based on Jerome Robbins’ original choreography includes “The Small House of Uncle Thomas,” the Far Eastern version of Harriet Beecher Stowe’s ”Uncle Tom’s Cabin,” beautifully choreographed by Gatelli and performed by the cast.. Catherine Zuber won the Tony for her costumes for this production, as did Scott Lehrer for his sound design. This tour has made some accomodations from the Broadway production, the cast reduced from more than 50 to a still-robust 37, and the 29-strong Broadway orchestra reduced to 17, but the score doesn’t seem to have suffered for it with the Opera House’s excellent sound system. The songs have long since been esconsced in the Great Hollywood Songbook and they roll forth, after the now-uncommon long-form overture. They include “I Whistle a Happy Tune,” “Hello, Young Lovers” “The March of the Siamese Children,” “Something Wonderful,” “I Have Dreamed” and, of course, “Shall We Dance?”, and they are all welcome memories from past productions and the film featuring Brynner and Deborah Kerr. There have been in recent years some calls for the book by Hammerstein to be updated to reflect modern values and attitudes. Nope. It’s a snapshot of a time and place, and the attitudes and values that were in place at the time. To “sanitize,” say, the language in “Big River” or the portrayal of Puerto Ricans in “West Side Story” would do a disservice to both the artists and the theater-goer. If the work offends you, stay home. 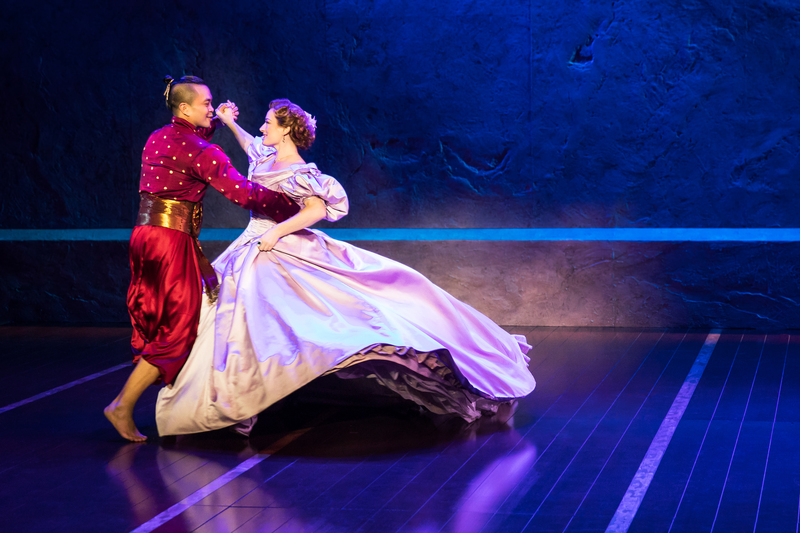 This production of “The King and I” is a feast for the eyes and ears, a tribute to the greatness of Rodgers and Hammerstein and a fresh new look at a musical that has never failed to entertain.